I did a little holiday baking on my day off from my internship today. St. Patrick’s Day is later this week, but I won’t have a lot of time to putter around in my own kitchen on that day so we’re having our Corned Beef and Cabbage tonight instead. And of course, I had to bake Irish Soda Bread too. I don’t really eat soda bread with the meal but usually have it with tea (or coffee!) during the week. 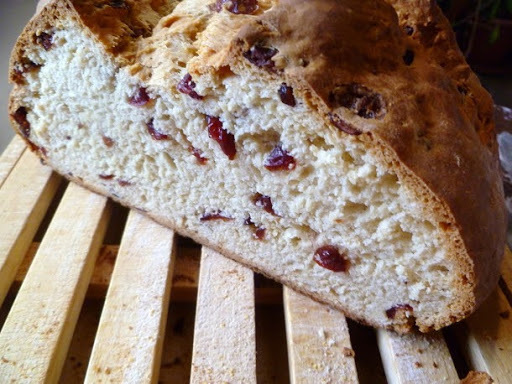 Typically, I make American-style Irish Soda Bread — that is, I add caraway seeds. I just like the way they make the bread taste, although I know they aren’t to everyone’s liking. This year, however, I opted to try a new twist. No caraway seeds, but (and this was an epiphany to me) the raisins and dried cranberries are soaked in Irish whiskey! Tell me, what says St. Paddy’s Day better than a little Jameson’s in your soda bread? I found the recipe on Serious Eats, and converted the recipe’s volume measurements into weight because I prefer scaling my ingredients to washing a lot of measuring cups. I also used dried buttermilk powder (I use Saco) rather than fresh buttermilk. It’s great stuff — you add the powder to the dry ingredients and add the appropriate amount of water when you incorporate the wet ingredients. Store it in the refrigerator and you don’t have to worry about wasting half-used cartons of fresh buttermilk. You can also substitute soured milk (1 tablespoon of white vinegar per 8 oz. of milk, stirred and left to rest for 5 minutes before using), but I think the buttermilk powder yields better results. Combine the cranberries, raisins and whiskey (or hot water). Cover and set aside to rehydrate for at least 30 minutes, or overnight. In a medium mixing bowl, combine the flour, baking soda, salt and dried buttermilk powder. Whisk to combine. Cut the butter into slices, then work it into the flour with your fingertips until it is fully incorporated. Add the honey, water and the cranberries and raisins with the soaking liquid. Stir with a wooden spoon until all the liquid is absorbed. Flour your work surface lightly and turn out the dough. It will still be sticky — try to avoid adding more flour. It’s helpful to flour your hands and use a bowl scraper or a spatula blade to help you maneuver the dough around. Form the dough into a 6-8 inch disk about 1 1/2 – 1 3/4 inches high and place it on your prepared baking sheet. Cut an X in the top of the dough across the top, about 1/2 inch deep.